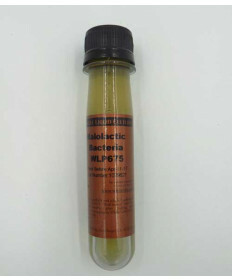 Adding fresh liquid malolactic bacteria cultures at the end of primary fermentation is a great way to provide rapid and complete malic acid to lactic acid reduction. Malolactic fermentation softens, balances and adds complexity to wine. 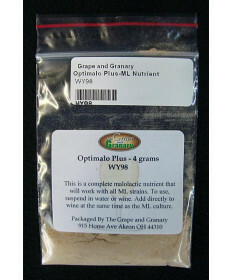 Grape and Granary provides winemakers with these fresh liquid cultures from both Wyeast Labratories and White Labs.. These cultures perform well in conditions of low pH and cool cellaring. They are suitable for pH of 2.9 or greater and cellar temperatures as low as 55 deg F. Dosage is one pack per 5-10 gallons of wine. 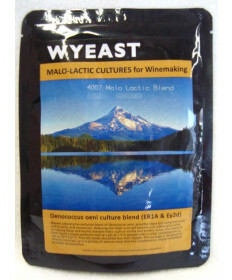 The malolactic culture should be added at the end of the primary fermentation. Adding a malolactic bacteria nutrient such as Optomalo Plus at the same time as adding the culture is a good idea, especially when working with white wines. White wines can be quite low in the necessary nutrient to complete a malolactic fermentation. Conducting a Malolactic Fermentation on your red or white grape wines will help reduce the harsh, sharp malic acid in the wine by converting it to the softer and smoother lactic acid. Other flavors are often produced as a result of ml fermentation including 'vanilla' and 'buttery' notes. Note: Naturally occuring malolactic bacteria on fruit may be of inferior quality or quantity to complete malo-lactic fermentation. Contact Us if you have questions about malolactic fermentation.